Thursday's coup in Sudan may have seen the overthrow of an unpopular president but those close to Omar al-Bashir are determined to stay in power, writes Sudan expert Alex de Waal. For the first time in almost 30 years, Sudan is not ruled by President Omar al-Bashir. But when Sudanese listened to Lt Gen Awad Ibn Auf announcing a transitional military council, they would have heard his master's voice. Gen Ibn Auf is a career soldier, cut from the same cloth as Mr Bashir. He was head of military intelligence during the conflict and atrocities in Darfur, for which he was put on a US list for targeted financial sanctions. He was defence minister and after President Bashir declared a state of emergency on 22 February, Gen Ibn Auf was also promoted to serve as vice-president, with the implication that he would step into the president's shoes when the his constitutional term expired in April 2020. 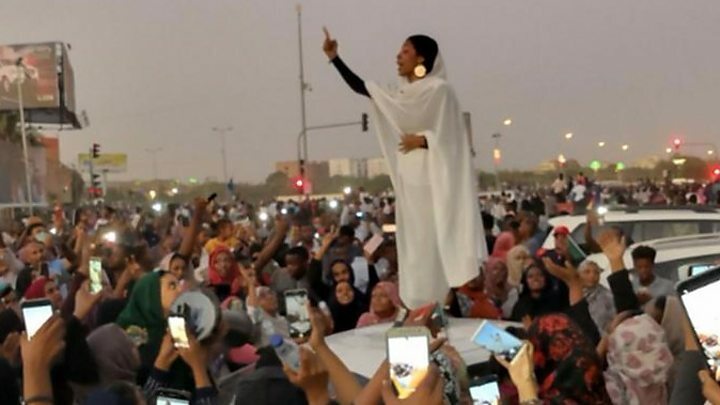 The trigger for the removal of Mr Bashir was a five-day round-the-clock peaceful protest in which tens of thousands of people surrounded the army headquarters in Khartoum, demanding that the president step down. But what happened next was determined by hard bargaining within those buildings, among the military oligarchs who sat just beneath the president in the security hierarchy. 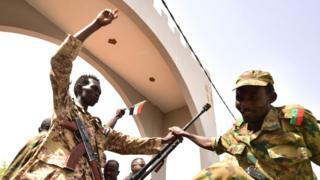 During the course of Thursday, there was a protracted silence from the military headquarters while Gen Ibn Auf, the senior commanders of the Sudan Armed Forces and other key security figures such as Gen Salah Abdalla Gosh, head of the National Intelligence and Security Services (NISS), haggled over the political dispensation that would follow Mr Bashir's removal. When Gen Ibn Auf finally addressed the nation, he announced the removal of President Bashir, the abolition of the constitution, the formation of a transitional military council, a state of emergency and a two-year transition. But he did not invite opposition representatives into government. In fact, he did not even offer to talk to them. The details of the pact among the security cabal are not public. But the outline is clear. First, the army, NISS and the paramilitary leaders (such as Mohamed Hamdan "Hemeti", commander of the Rapid Support Forces) want to share power among themselves. They want to avoid a repeat of clashes that occurred earlier in the week, when army units fired on NISS militiamen who were trying to disperse the crowd of protesters by force, let alone an internecine war on the streets of the capital. Second, the cabal is aligned with Egypt, Saudi Arabia and the United Arab Emirates. Meanwhile, Qatar and Turkey have lost out. The new leadership dissolved the ruling National Congress Party (NCP) and reportedly arrested many veteran Muslim Brothers. They are busy telling Western countries that the Islamists had planned a coup, which needed to be forestalled by the army takeover, and that the protesters demanding democracy are also Muslim Brothers in disguise. It's not a very convincing story, but it points to future tensions because the Islamists still have a strong following in Sudan. Third, the coup leaders will protect the ousted president, even while they blame him publicly for the country's ills. The official announcement spoke of him being kept in a "safe place". They will not hand him over to the International Criminal Court, where he is wanted for crimes in relation to the Darfur conflict. Partly this is because they are no less responsible than Mr Bashir for the atrocities in Darfur and elsewhere. It is also because that they know that one of his biggest assets was his reputation for loyalty to the officer corps, and they hope that some of that legacy will rub off on them. Keeping the current security coalition intact will be impossible if any one of them starts fearing he may be handed to a foreign power or court. And fourth, they have not decided how to handle the challenge posed by the demonstrators, who are still massed on the streets.